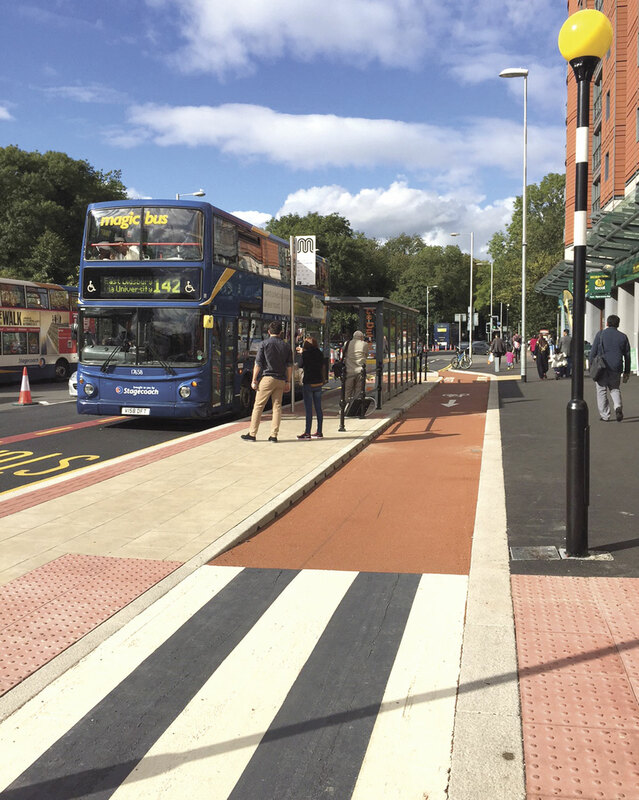 Transport for Greater Manchester (TfGM) and Manchester City Council has introduced a Dutch-style bus stop and cycle lane on the city’s Oxford Road. A common urban feature in the Netherlands, the new style bike lane is designed to make it safer for cyclists passing bus stops. Instead of overtaking a bus, the rider can cycle ‘behind’ the bus stop. A coloured cycleway featuring pedestrian crossing points, including a zebra crossing, informs riders, pedestrians and bus passengers of the layout. It is being used to run a ‘real-time’ trial before more are built. Anyone using it, including cyclists, bus passengers and pedestrians, will be asked for their feedback on the new design. It is part of a wider bus priority package designed to improve the quality, punctuality and reliability of bus services on 25 miles of key routes in Greater Manchester. It is also the flagship scheme in the Cycle City programme that will look to increase cycling to 10% of all trips made in Greater Manchester by 2025.